Soothe skin problems such as acne, eczema, redness etc. with Avene Thermal Spring Water. Check out Avene Thermal Spring Water reviews, features, benefits and much more here. What is Avene Thermal Spring Water? It is important to keep your skin healthy and hydrated. Environmental challenges can leave your skin dehydrated. While oily skin can trigger acne and breakouts, dry skin can make your skin look dry, dull, and flaky. Among the many products of Avene, the simplest product that works for all skin types is undoubtedly the thermal spring water that is offered by the company. The company manufactures many skin care products such as moisturizers, face masks, acne control cleansers, body lotions, and much more. The key ingredient of almost all the product is thermal spring water. Apart from that, the company also runs a water therapy center, a spa formed in 1990 that also specializes in testing the spring water. Avene Thermal Spring Water is loaded with powerful minerals that calm down any inflammation and gives you refreshing skin every day. Avene Thermal Spring Water is derived from Cevennes Mountains in Avene, France. It undergoes a natural filtration process to give you purest form of water. As it has the right balance of cations and anions that makes great pH level 7 (neutral), it is perfect to offer numerous benefits. It is not bit acidic or alkaline. It calms down any redness or acne, refreshes the skin while traveling and soothes any itching. This Thermal spring water has many uses – as an after-shave lotion or to cure diaper rash in babies. As per manufacturer’s claim, one bottle of spring water is sold every two seconds globally. Available in a spray bottle, it is easy to use without any hassles. How does Avene Thermal Spring Water Spray work? The spring water spray is made up of a carefully formulated composition to give you low mineral content and has lots of anions, cations, and trace elements. It is also loaded with silica that is gentle on the skin and soothes them effectively. Another advantage of using low mineral water is that minerals can dry out the skin. Hard water leaves minerals on the skin’s surface that absorb all the moisture. Needless to say, people who are dealing with psoriasis or eczema tend to have more symptoms as they might be living in an area with hard water. Furthermore, high mineral content can cause clogging of pores that can also cause acne and frequent breakouts. With low mineral content in Avene products, it aims to alleviate moisture loss in the skin as well as clean pores that breathe easily. Silicate – Avene Thermal Spring Water Spray comes with high concentration of silicates. While the studies are still going on, skin experts believe that silicates can enhance the pH level of the skin. 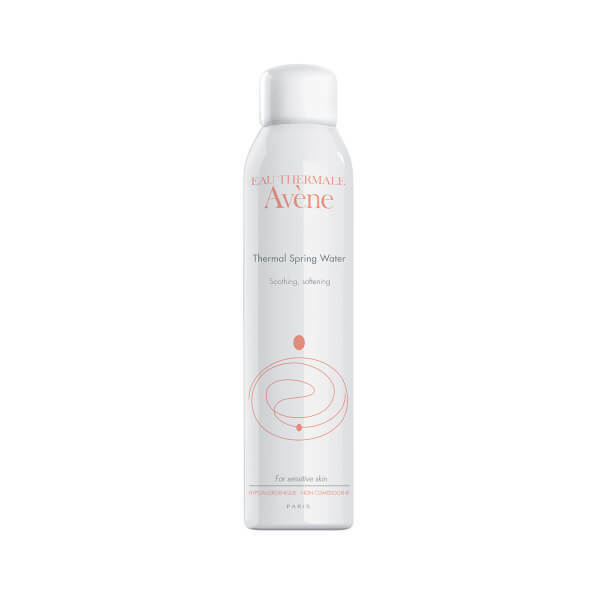 Neutral pH – Avene Spring Water Spray targets hypersensitive skin due to its neutral 7.5pH level. This is one of the main selling points as neutral pH does less damage to the skin. The second ingredient is Nitrogen, not nitrogen gas but nitrogen atoms as a propellant. This best spring water has many uses and benefits on the skin. It soothes painful acne, pimples, and other breakouts. It is gentle on the skin and increases tolerance of the skin. The spring water curbs any allergic reactions such as rash or redness. Use the spray to alleviate the symptoms of sunburns. Use this at any time of the day when you want to keep your face clean, refreshed, and hydrated, especially during hot summers. You can use it as a cleansing agent after removing makeup using Avene Micellar Lotion. The anti-bacterial properties keep the skin protected and soothes any pain from injuries or wounds. You can use it with beauty blender or sponge to set your foundation as it blends smoothly without causing dry patches. The best part is it is safe for babies, kids, and adults. You can use it to get rid of any diaper rash in babies or clean wounds/injuries in kids. It is available in a compact size which makes Avene Thermal Spring Water travel-friendly. Choose between 10.58 oz, 5.29 oz, and 1.76 oz sizes. Avene Thermal Spring Water Spray is completely preservative and oil-free. A hypoallergenic product, it gives you instant hydration. Simply remove the cap and press the nozzle to spray at your face. Maintain a minimum distance for optimum effectiveness. Pat the water using clean fingers for more absorption and instant refreshed feeling. You may also apply a foundation after using the spring water spray. Close your eyes while spraying the mineral water to avoid contact with eyes. Too much of anything is not good. Similarly, too much sprintz of this spring water can cause dryness. While it helps with moisture too much water can be drying, explains Emma Guttman, a dermatologist at Mount Sinai Hospital in New York and the director of the Center of Excellent in Eczema. It’s just like washing your hands many times can cause dryness. Avene Thermal Spring Water Spray has received mixed reviews from users. Some users say that they have noticed an improvement in their skin after using the product. They report that it instantly soothes the skin and give a fresh feeling. If you use harsh soaps or deal with general inflammation on the skin, using thermal water spray will balance your skin and act as a barrier. It even works for reducing hot flashes in women. One user used this to soothe ravaged face after a reaction to laser treatment. After using Avene Thermal Spring Water, her skin symptoms was calm for 48 hours. Here are few of the positive responses from users. User Fontainemullins says that she used this while going through labor. She was having pre-eclampsia where she was given mag that heats up the body. She used Avene cool water spray to cool her down. She even uses this on her son to soothe her son’s heat rashes during summer. Yarie says that she uses this as a toner. It relieves pain and inflammation after wax and calms down the redness. Her mom uses it for her hot flashes. However, there are few complaints received for Avene Thermal Spring Water. BlueEyedJess says that while it works on rest of the body, she noticed that her face broke out. Choomshin says that while the product works well, the nozzle keeps getting stuck and does not work after a while. TeaLeafDoll says that she did not notice a difference after using the product. The mineral content irritates the skin as well. While there are no before and after pictures of users post usage of Avene Thermal Spring Water, you can find reviews at sites such as Reddit, Amazon etc. What is the shipping policy of Avene miracle water spray? The company offers free shipping anywhere in the US on orders above $45 including Alaska and Hawaii. PLUS, you will also get two samples absolutely FREE of any Avene products. The company currently does not ship internationally. What is the return policy for Avene acne relief spray? If at all you are not happy with the product, the company offers 30-day return policy and 60-day online store credit or an exchange. What is the price of Avene Thermal Spring Water Spray? The price of Avene Thermal Spring Water is affordable (less than $20) and falls within the budget. Does Avene Thermal Spring Water treat rosacea? Yes, as per user reviews, avene miracle water does work in reducing rosacea flushes, redness, and other symptoms. People report that the skin instantly begins to calm down. Is Avene Thermal Spring Water available online in India? Yes, the Avene and its products are available worldwide including countries such as India, UK, Australia, Canada, Singapore and so on. You can order from the official website or from Amazon respective website (as per country). Is Avene Thermal Spring Water good for sensitive skin? Absolutely. Avene Thermal Spring Water and related products are designed for all skin types to include sensitive and hypersensitive. Made using natural ingredients, they work effectively on the skin. Can Avene Thermal Spring Water work on oily skin? Yes, it controls the excess sebum production in the sebaceous glands. As a result, you will notice less grease on the skin and more supple and clean skin. Is it okay to use Avene Thermal Spring Water on hair? The product is specifically designed to use as part of skincare regime. It is best to not use it on the hair or other sensitive parts of the body without getting a nod from the dermatologist. Is Avene Thermal Spring Water a toner? No, Avene Thermal Spring Water is not a toner. It is pure water that comes with holistic ingredients to give you immediate freshness and calm down any skin burn or redness on the skin. Can Avene Thermal Spring Water work for acne? Few users report relief from acne after using Avene Thermal Spring Water. However, it is best recommended that you use Acne-relief products available at Avene website. Where to buy Avene Thermal Spring Water at wholesale price? You can buy Avene Thermal Spring Water Spray at Amazon, Walmart, and Walgreens. Sourced from Auvergne Volcanoes in Central France, Vichy comes with 15 minerals and microelements. While the effects are fantastic, it doesn’t last long unlike Avene. The water of Vichy which makes it saltier. So you will find a tingling sensation whenever you spritz on the face. Avene offers a small size unlike Vichy so if you want to invest less, this is best recommended. Another disadvantage noticed in few reviews of Vichy is that it doesn’t do anything to calm the redness. La Roche Posay is one of the biggest brands just like Avene. They offer many products at a cheap price without compromise on the quality. However, the con side of Laroche Posay is that it doesn’t suit sensitive or irritate skin. Nevertheless, it is great for normal skin. Some users also claim that it dries out the skin quickly which pretty much nullifies the purchase. The Prep+ Prime Fix+ by Mac Cosmetics is a lightweight water mist that also works as a gentle cleanser and makeup remover. It is packed with vitamins and minerals that are also infused with other natural ingredients like green tea, chamomile, and cucumber. This gives a cool feeling to the skin while boosting the hydration. There are different fragrances available as well. Compared to Avene, the price of Mac Fix is a bit costly. For a regular user who is on a budget, this can pose a problem. That said, reviews of Mac Fix is excellent. If you can loosen your purse strings a bit, this is best recommended. Both Evian and Avene are made in France. Evian is the same company that manufactures Evian Drinking Water. While both come with the same characteristics, a couple of users report minor bumps on the head after using Evian. This may not be necessary for everybody. The price of both the products is almost the same. Experiment and see which works for your skin. As compared to Avene, Bio Essence claims to offer 2x cooling, softening, and moisturizing effects. It also whitens the skin and carries anti-irritating effects. A product from Malaysia, it has a pH level of 6.45 as compared to 7.5 (of Avene that is perfect). The price of both the products are the same and offer similar benefits. The huge advantage of Avene is it is bottled directly from the source that is bacteriologically pure. That’s not the case with Bio-essence. Both brands are excellent in their own ways and offer good benefits. If you have no problem buying outside the USA, you can go with Bio-essence or else stick with Avene. Caudalie’s water mist is 100% organic that moisturizes and tones the skin. Loaded with polysaccharides, it creates a barrier that protects your skin. What makes Caudalie different other water mist is it contains grape water and grape juice that offers nutritious benefits to the skin. You can also use Caudalie as a toner that offers you great results. It does not stick to the skin is absolutely oil-free and absorbs easily. But does it feel any different? No. Few users report that Caudalie feels like just any other mist spray. Price is definitely affordable. If you want to try something new in facial mist, you can go ahead with Caudalie or else stick with Avene. If you are feeling with dehydrated skin, then, Avene Spring water spray is for you. If you are having a healthy skin, you probably don’t need this. That being said, Avene Thermal Spring Water is certainly one of the biggest brands in the US. It is one of the products that has received great reviews on Amazon. For those who are having dull, problematic skin, invest in a small can of Avene and check if you feel any difference.